HISTORY was made in Lynemouth on 1st June 2016 as the Parish Council conferred the Honorary Freedom of the Parish on Councillor Gillian Thompson, MBE, and Mrs. Sarah (Sadie) Hannah Williamson, MBE. At the Annual Meeting of Lynemouth Parish Council on Wednesday, 4th May, 2016 it was unanimously agreed that Honorary Freedom be conferred upon Gillian and Sadie in recognition of their eminent service and contribution to the well-being of their area. 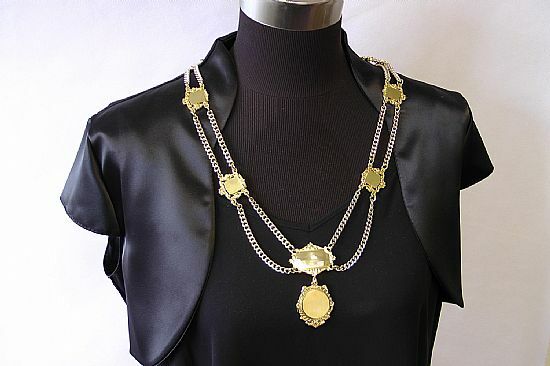 The civic chain is a ‘Filigree’ style chain collar with large central base plate with LYNEMOUTH PARISH COUNCIL engraved and enamelled, a 1” diameter pendant with CHAIRMAN engraved and enamelled, with PRESENTED BY THE PARISH CLERK 2016 inscribed on the reverse; and 6 small chain plates. The Chairman's chain of office was purchased by the Clerk to the Council and was presented on Wednesday 7th December 2016 as a private donation (a gift) to the parish of Lynemouth, which will be passed over to those who take up the chair of office. The Chair of the Parish Council presented each scroll and said: "A record of many years of public service is a tremendous achievement. Gillian Thompson and Sadie Williamson have both made a significant contribution to the community throughout that time and continue to do so today. Both hold the MBE for services to the community for a range of work. The Parish Council is proud and honoured to confer Freedom on such worthy recipients. 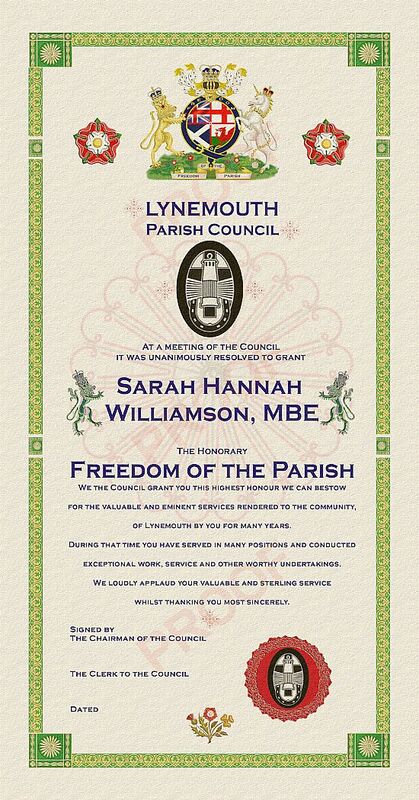 On behalf of the Parish Council, I wish to officially thank you for conducting exceptional work, service or other worthy undertakings that benefit the community of Lynemouth by presenting you each with a Freedom Scroll, the highest honour it can bestow." The Council thought it fitting that Councillor Thompson should be the first recipient of the honorary freedom of the parish. Gillian has served in many positions and held the offices of councillor and chairman for several periods. The Council also felt that Mrs. Sadie Williamson has rendered eminent services to the parish and has contributed to the well-being of her area. A founder member of Lynemouth Ladies’ Tuesday Club, social secretary for a Darby and Joan club, running a dancing class, and still going strong organising the annual shoebox appeal. The title 'Honorary Freeman' is bestowed upon certain individuals, or past Members, who have, in the opinion of the Parish Council, rendered eminent service to the Council, or conducted exceptional work, service or other worthy undertakings that benefit the community in Lynemouth. A local council is permitted by legislation (Section 249 of the Local Government Act 1972) to admit, further to a council resolution, to be honorary freemen or freewomen of the place or area for which it is the authority (a) persons of distinction, and (b) persons who have, in the opinion of the authority, rendered eminent services to that place or area. In 2009 Parliament passed the Local Democracy, Economic Development and Construction Act in which Councils were given the right to grant honorary Freedoms in their area of jurisdiction. The honorary freeman title confers no powers on the individual. It is entirely ceremonial. The Parish Council officially thanks people who conduct exceptional work, service or other worthy undertakings that benefit their community by presenting them with a Freedom Scroll as a timeless thank you. The scrolls are highly regarded by recipients. To be granted the title of Honorary Freeman is a mark of distinction upon the person whom the Council wishes to honour. The Freedom itself carries no privilege and is purely an honour, reflecting the eminence of the person on whom it is conferred or as recognition of significant and valuable services rendered by that person. A sealed and illuminated certificate of the grant of Honorary Freedom, containing a copy of the formal resolution, is presented to the newly appointed Honorary Freeman by the Chairman, with an opportunity being given for the recipient to reply. The Chairman (or Chair) and Vice-Chairman (or Vice-Chair) of the Parish Council are elected in May each year at the Annual Meeting of the Parish Council. The Chairman of Lynemouth Parish Council has responsibilities within Lynemouth and occasionally represents Lynemouth outside the Parish. If the Chairman is unavailable for any reason then the Vice-Chairman or another appropriate councillor may represent the Chairman. - Any other occasion which the Chairman considers it appropriate. Mr Keith Murray-Hetherington, JP [2013-PRESENT].